On December 9, 2010, NGO Monitor released an expanded edition of the “NGO Lawfare” monograph. The publication demonstrates and analyzes the ways in which non-governmental organizations (NGOs) using the language of human rights are exploiting European and US courts. These groups have initiated criminal and civil cases against Israeli officials for supposed “war crimes,” as part of lawfare – the use of legal frameworks to achieve political and military goals. The monograph documents the central roles of groups such as the Palestinian Center for Human Rights (PCHR), Al Haq, and others in implementing strategies for the prosecution of Israelis. PCHR has repeatedly sought to have Israeli officials arrested for the July 2002 targeted killing of Hamas leader Salah Shehade, who had orchestrated terror attacks that killed and wounded hundreds. Al Haq has pursued judicially imposed boycotts and sanctions against Israel in the UK and Canada. The updated monograph also documents the ongoing Goldstone process, in which NGOs have been lobbying Western government to support the implementation of the report’s unfounded recommendations, including cases against Israelis in the International Criminal Court (ICC). 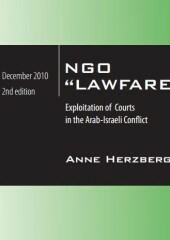 NGO Monitor’s September 2008 Lawfare report was the first in-depth study of the role of NGOs in promoting the expansion of “universal jurisdiction” statutes worldwide; the creation of the lawfare strategy against Israel at the infamous 2001 Durban Conference; and the leading role NGOs have played in these cases. The updated report also documents funding from the EU, a number of European governments, the Ford Foundation, and George Soros’ Open Society Institute for the main NGOs promoting lawfare. Jeremy Rabkin, “Lawfare: The International Court of Justice Rules in Favor of Terrorism,” The Wall Street Journal, September 17, 2004, available at http://www.opinionjournal.com/forms/printThis.html?id=110005366. For more information on the Durban Conference, see Gerald M. Steinberg, “The Centrality of NGOs in the Durban Strategy,” Yale Israel Journal, Summer 2006, available at http://www.ngo-monitor.org/article.php?viewall=yes&id=1958. David Davenport, “The New Diplomacy Threatens American Sovereignty and Values,” in “A Country I Do Not Recognize”: The Legal Assault on American Values 113, 119 (Robert Bork ed., 2005), available at http://media.hoover.org/documents/0817946020_113.pdf.